Rabbit anti CFP antibody recognizes the cyan fluorescent protein (CFP), a monomeric engineered derivate of green fluorescent protein (GFP) isolated from the jellyfish Aequorea victoria. CFP is a ~31 kDa protein that is optimally excited at a wavelength of 439 nm and emits light at 476 nm (Day and Davidson 2009). In FRET (Fluorescence/Förster Resonance Energy Transfer) experiments, CFP is often used in combination with YFP (yellow fluorescent protein) (Karpova and McNally 2006). Antiserum to cyan fluorescent protein (CFP) was raised by repeated immunisation of rabbits with highly purified antigen. Purified IgG was prepared from whole serum by affinity chromatography. 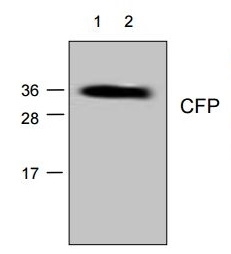 Rabbit anti CFP antibody recognizes a band of approximately 31 kDa on recombinant CFP. The observed band size is approximately 35 kDa. This antibody has minimum cross-reactivity with Yellow Fluorescent Protein. Day, R.N. & Davidson, M.W. (2009) The fluorescent protein palette: tools for cellular imaging. Chem Soc Rev. 38 (10): 2887-921. Karpova, T. & McNally, J.G. (2006) Detecting protein-protein interactions with CFP-YFP FRET by acceptor photobleaching. Curr Protoc Cytom. Chapter 12: Unit12.7.